When players reach the end of Act IV in the Diablo III video game, they get to see a cinematic that shows Diablo falling from the High Heavens as his/her body turns into ashes. (Diablo is male, but the body he chose to possesses this time around was female, so players see a very feminine Diablo in the game). We watch Tyrael, now mortal, return to a place in the Angiris Council. He has ceased to be the Aspect of Justice, and becomes the Aspect of Wisdom. Tyrael took the vacancy that was left by Malthael when he disappeared. The beginning of Act V starts with a cinematic that shows Tyrael, and a group of Nephalem, moving the black soulstone into a location that players may not immediately recognize. Malthael has returned, and is up to no good. What happened in between those two Acts? The first time I saw that cinematic I thought it was amazingly well animated, and creepy, and compelling. That begin said, it left me with many questions. Diablo III: Storm of Light provided me with all the answers. I found it to be extremely satisfying on many levels. Tyrael is one of the main characters in the book. He is mortal now, and struggling to fit in with the Angels. Tyrael is feeling his body age and is noticing aches and pains that he never experienced when he was immortal. He’s been attempting to sleep on the hard floor in the High Heavens, a place that is filled with a bright light at all times. There are no beds, kitchens, or bathrooms where the Angels exist – they don’t require them. Tyrael, however, does. In addition to physical discomfort, he’s also been pushed into a painful emotional place. The other Angels, even the ones on the Angiris Council, have stopped trusting him – and Tyrael is well aware of it. For centuries, they were his brothers and sisters, his comrades in battle, and his family. Since he has become mortal, many have started to wonder whose side he is really on. Is Tyrael’s advice truly what is best for the Angels? Or, has his loss of immortality caused him to feel more connected to the humans/Nephalem on Sanctuary? Kenyon did a great job of making Tyrael’s loneliness achingly real without ever using that particular word. There is absolutely no one else in the Diablo “universe” who is like Tyrael. On the one hand, this is a curse. Where can he fit in, be trusted, be welcomed with open arms now? On the other hand… the uniqueness of Tyrael is what allows him to see realities that the Angels are oblivious to. 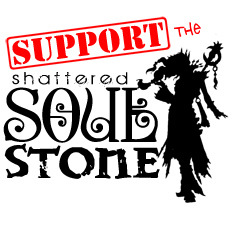 Tyrael is the only being in the High Heavens who is aware that the black soulstone is causing corruption not only in the High Heavens itself but also in the Angels. He tries to explain that to the members of the Angris Council, but they aren’t listening. What to do? Tyrael is no longer the Aspect of Wisdom, but he is still very smart. He knows that the black soulstone must be removed from the High Heavens. It must be placed somewhere that the Demons cannot access. He comes up with a plan that requires the participation of a group of very powerful humans. Their quest will be difficult, and will require them to work together as a team. Right now, many of the humans that Tyrael has in mind are strangers to each other. They must succeed on what is a very Heroic mission that could save not only Sanctuary, but also the High Heavens. Or, it might turn out to be a “suicide mission”, as the Wizard Shanar describes it. Those who have read some of the previous books in the Diablo “universe” will be especially excited to follow “Tyrael’s Avengers” through the story. They are familiar and well loved characters. I could not help but smile as I discovered who each one was. I won’t give away any “spoilers” about the story, and I won’t tell you if the quest was a success, failure, or a bit of both. I will, however, share information that is printed on the back of the book’s cover, and point out where you can read further adventures of each character. You can read more about Tyrael’s experiences in the Diablo “universe”, and his view of significant events in it, in The Book of Tyrael. It is not a novel. It is more like the “monster manual” that Dungeons & Dragons produced. You can learn a lot about the lore in that book. Shanar, whom I’ve already mentioned, is a character from a comic book called Diablo: Sword of Justice. She is an incredibly powerful (and snarky) Wizard who has a history as a guardian of Tyrael’s sword. Jacob of Staalbreak comes from the same comic. He once was the avatar of Justice and the one who carried Tyrael’s sword after it was lost. Gynvir also comes from the same comic. She is a fierce Barbarian who fights hard and also has strong feelings for those she loves. I’ll leave you to find out her part in the comic. Mikulov is a monk who is so interesting and delightful and real that I am certain that there are several players who named their male Monk characters after him. He comes from the book Diablo III: The Order. You can learn more about Mikulov in the short story called Brothers In Arms, which was written by Scott Brick. Zayl, a mysterious necromancer, (and his companion, Humbart) also make an appearance. The duo are very popular characters in the Diablo “universe”. ou can read more about them in the book Moon of the Spider, which was written by Richard A. Knaak. I’ve not mentioned all of “Tyrael’s Avengers”, so you will have more to discover when you start reading the book. 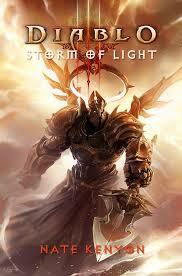 Diablo III: Storm of Light is a book that pulled me in from the moment I started reading it. I forced myself not to speed through it because I wanted to savor it, to have the time to “run around” in the book for a while. This is a book that I will happily read again, and again.